Today is National Garlic Day! This makes me laugh a little because I use garlic almost every day, why do I need a commemorative day to celebrate everything that is great about the Allium sativum? Garlic Bread, Garlic Mushrooms, Garlic infused olive oils..... I could go on but I would be here all day. Although maybe I'm being unfair by suggesting that garlic doesn't need a national day, after all garlic is probably an ingredient that we eat both consciously and unconsciously in all manner of everyday foods and flavourings. The noble garlic bulb has help influence they way we cook at home. Answer me this, who doesn't have garlic as an ingredient in everything from Italian, Chinese, Indian, through to even the most standard British dishes like cottage pie, or a slow cooked roast? Thinking about it, I love garlic! My favourite is probably smoked garlic bulbs. If you ever see smoked garlic in your local deli or farmers market, then pay the extra 50p and take a couple of bulbs home with you. 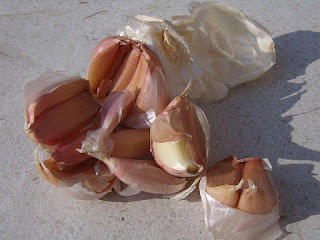 What's your favourite use of garlic? Do you prefer the subtle back flavours that garlic can bring to a dish, or is it the big punch of garlic that drives you wild? Either way, garlic will always be my friend.